Yesterday Target debut their Missoni collection from clothing, to bedding, beauty, accessories, to bath, you name it they had something Missoni. It hadn't crossed my mind until yesterday evening that Target debut this collection and to be honest I guess I didn't realize how big it was actually going to be. I tried for 45 minutes to get onto the Target website, come to find out the site had crashed and was down for quite some time. Instantly I knew this wasn't going to be easy to get a hold of. Finally when I got onto the site, almost everything had been gone. It wasn't even a day and they were already selling out of majority of the collection. (at least the things I had my eye on) I decided today that I should probably check out my local Target to see what they might have left over, before even arriving I expected the worst sparing my disappointment. Well I was right EVERYTHING was picked over. Its incredibly crazy if you think about it, 1 day and literally wiped out like it was black Friday! They did have a few cosmetics bags, I did pick up a medium size one which wasn't one I initially wanted but what can you do. Their were a lot of baby clothes left very limited woman's clothing nothing I was looking for. I didn't find anything in the men section unfortunately I wanted to get Brandyn a few things. They were completely out of their scarfs, bags, luggage, and bedding. I was shocked I really want to get my hands on their throw blanket. On a positive note they did have a small selection of shoes left over. 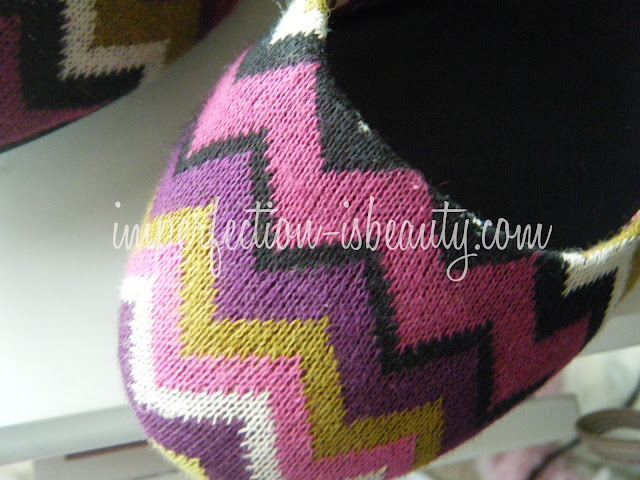 Missoni black sued pumps, some rain boots, and these gorgeous multi colored zigzag flats. Unfortunately, they only had 3 pairs of the zigzag flats left and these were definitely on the top of my wishlist. I freaked and bought them all. One for my sister, and maybe a friend and if they don't want them, well I can always take them back I figured grab them while I can. They didn't have any in my size so I had to get a half size larger. They aren't very comfortable at all, so I did pick up some Dr Scholls inserts to give me a little more cushion. The pattern is just so gorgeous, I love the whole zigzag design, and the texture is just amazing. Their is a no skid tread on the heel but the whole rest of shoe does not therefore, if I don't put a non slip grip on the toes I will probably hit the floor. 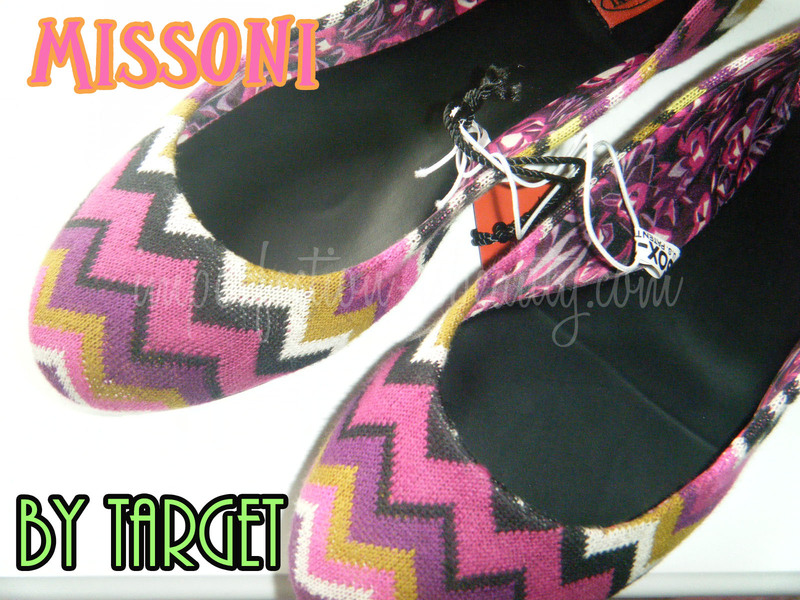 Overall if your into fashion, and the whole Missoni brand then I suggest to check out your local Target and see what you can get your hands on considering the price for Missoni at department stores are extremely expensive so for a fraction of the price get your hands on whatever you can. These ballet flats were only $30 Missoni flats at Nordstroms, and Saks Fifth Avenue run anywhere from $60-460 on Zappos Coutoure. The ones on Zappo's are very similar, the color is a little different but the pattern is pretty straight on. I'm not sure what will be restocked on the website, or if they're even restocking the site at all but in stores they will be restocking things here, and there through Oct 22 so I'm sure I'll be making some random stops to see what they get back in. the only thing I wanted was their bike, and their squared-toe black pumps but evrything was taken. I totally forgot about the collab. and I definitely paid for my absent minded brain! I hope you do a post with your new shoes on! I wanna see how you wear them and with what. Yep, only a few rain boots, flats and kids clothes were left at my target.